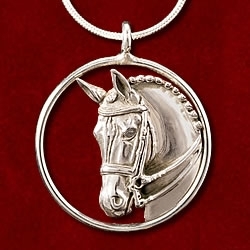 Stamped with his name on the back, it measures 1″ high by 3/4″ wide. The second view shows the secure squeeze back closure. All Ravel designs come in a blue gift box with blue pouch and commemorative card shown above. 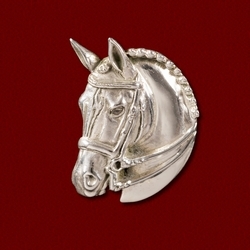 Ravel, the Grand Prix Olympic Champion inducted into the Roemer Foundation/USDF Hall of Fame in 2012, is now available in this licensed, sterling silver pin. 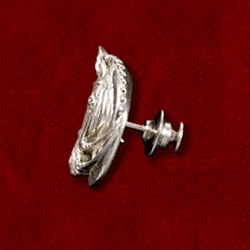 Great as a stock pin or on your favorite vest or jacket. 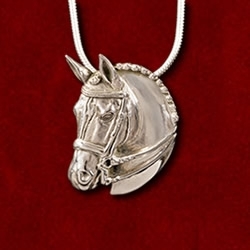 Stamped with his name on the back, it measures 1″ high by 3/4″ wide. The second view shows the secure squeeze back closure. All Ravel designs come in a blue gift box with blue pouch and commemorative card shown above. 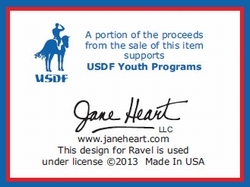 A portion of the proceeds benefits USDF’s new Ravel Education Grant program. 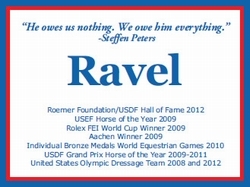 Worn by Team Ravel at his retirement ceremony on April 27, 2013 in Del Mar. Order yours today!